Call For Free Limousine Service Quote at 310.697.8756. Southern California All Occasion Party Bus Rentals since 2006. 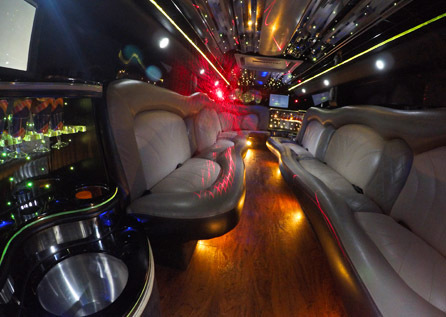 IN NEED OF RELIABLE PARTY BUS LIMO SERVICE IN REDONDO BEACH? We are proud to service Redondo Beach, Manhattan Beach, Hermosa Beach, Palos Verdes, Torrance, San Pedro, Hawthorne, Gardena, Carson CA and greater Los Angeles. We have very courteous and professional drivers along with fun limo and party bus options to make your bachelorette night safe, fun and simply unforgettable. We are your one stop shop concert limousine party bus transportation to Staples Center or anywhere in Southern California. Weekly Deals and Specials Available! Professional, knowledgeable chauffeurs meticulously maintained shuttle, limo buses and limousines makes us corporate transportation leader in Redondo Beach CA. Love and support our local sporting team? We are leading limousine service provider for Staples Center, Dodger Stadium, Rose Bowl, USC Coliseum, Angels Stadium. Need a reliable wedding shuttle bus transportation provider in Palos Verdes area? We have wide range of 20-50 passenger shuttle bus options to choose from. Our PROFESSIONALISM and PASSION make our team unique in every sense. Have a question? Give us a call at 310.697.8756 and let’s discuss your transportation needs. 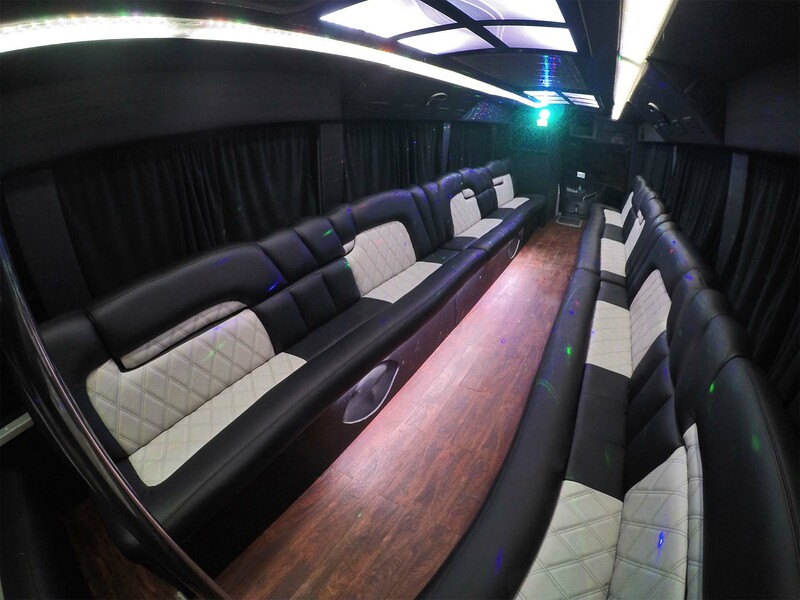 For your next event from an unforgettable birthday to your bachelor or bachelorette party, why not choose the sleek style and comfort of our Mercedes Sprinter party bus? Sit back, relax and enjoy the ride with up to 10 of your closest friends and family with all of the amenities including a well-lit bar, luxurious leather seats with limo-style seating and first-class sound system. Our professional and reliable drivers will ensure your special occasion is worry free and one you’ll never forget! Our Mercedes Sprinter limo bus is an excellent transportation option for Palm Springs and Santa Barbara business meetings, and Las Vegas transfers from Los Angeles. Give us a call at 310.697.8756 and let’s discuss your next Los Angeles limousine transportation options. Make your next birthday, bachelorette/bachelor party or special event stand out with our 14-passenger party bus. 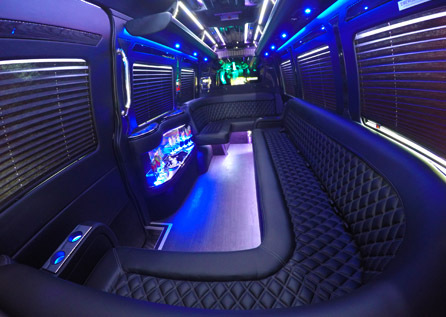 We’ll provide professional, reliable transportation so you and up to 14 of your friends and family can sit back, relax and enjoy the ride and your special event with top-notch amenities including luxurious limo-style seating, a first-class sound system and a beautiful, well-lit bar. Let our professional chauffeurs make your special occasion worry-free and a day you’ll always remember. When shopping around for corporate event transportation in Redondo Beach, CA and surrounding areas, choose a small company with an excellent track record of dependability – BestOCLimo.com. When it comes to executive shuttle bus services, our most popular transportation option is the 30 passenger shuttle bus, loaded with all the amenities to make your business meeting or convention shuttle bus transportation comfortable and worry free. 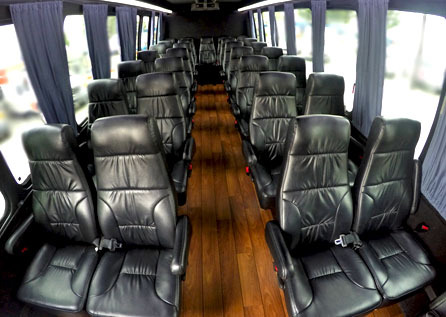 Our 30 Passenger shuttle bus features comfortable black leather seating with facing forward arrangement, wood floors, sound intercom entertainment system with shiny black exterior paint, making this amazing bus a best seller for any corporate event service in Los Angeles. 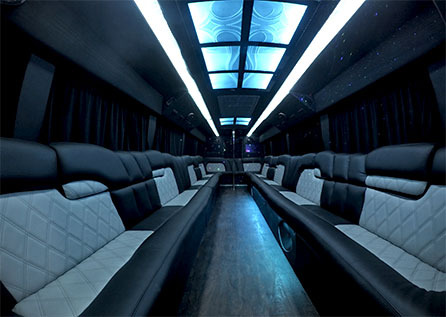 When it comes to birthday, bachelorette party or brewery, winery tour party bus transportation, we have a 5 star rated 20 Passenger E450 Limo Bus option. 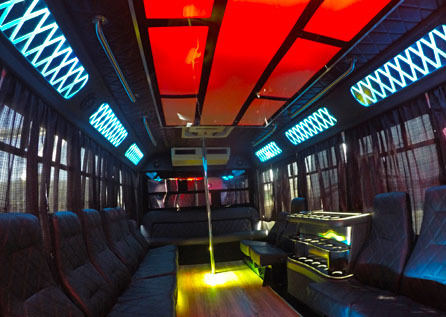 This fun party bus featuring a bar area with a large build-in ice bin, cup holders, LED light show and entertainment sound system with Bluetooth connection to make your next party bus experience one to remember. Our friendly and professional chauffeur will navigate the city and take your group to the destination safely and worry free. Give us a call at 310.697.8756 and let’s discuss your next party bus rental options. For an unforgettable wedding, quinceanera, sweet sixteen or simply a Hollywood night out, consider one of our stretch limousines. We are proud to offer our 10 Passenger Chrysler 300 stretch and Hummer SUV limousines with black or white exterior choices and luxurious interior full of entertainment features such as: bar area, disco color-changing ceiling, sound system with Bluetooth connection, TV screens and privacy partition. Our Stretch limousines are the ultimate experience and will provide lasting memories for your next special occasion. Our professional limousine chauffeur will provide you with the peace of mind that you will have a safe and fun time cruising with your friends to your final destination. Give us a call at 310.697.8756 and let’s discuss your next special occasion stretch limousine rental options. 30 Passenger Party bus can be rented for any occasion from concert, birthday party, wedding to corporate event transportation, but when it comes to prom, winter formal or homecoming dance transportation – 30 Passenger party bus is an all time favorite. 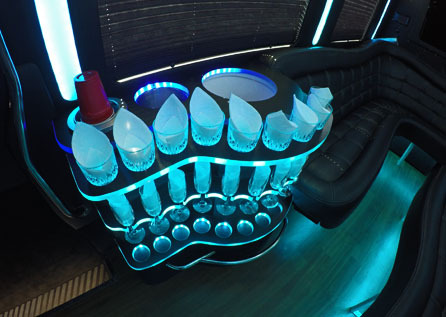 With features such as color changing disco lights, laser lights, multiple TV’s and bar areas with cup holders and ice bins, sound system with bluetooth connection just to name a few this party bus is an ultimate party on wheels. Our professional party bus chauffeurs are experienced and trained to navigate the streets of Hollywood or downtown Los Angeles safely and will carefully deliver your group to the final destination.Give us a call at 310.697.8756 and let’s discuss your next special occasion party bus rental options. We are dedicated to providing reliable and affordable limousine shuttle and party bus transportation for all of our clients. We offer a wide range of limos and buses to accommodate any of your special occasion or corporate event transportation needs in Redondo Beach, CA and surrounding areas. Let our experienced team provide you with our limousine and party bus services for your ground transportation needs in greater Los Angeles. BestOCLimo.com offers great weekly deals on birthday or bachelorette limo or party bus service in Redondo Beach, CA and surrounding areas. Reliable and affordable wedding stretch limousine, party bus or shuttle bus transportation in Redondo Beach area since 2006. Friendly and professional party bus chauffeurs and fun and exciting party buses with the latest entertainment and amenities to make your night truly unforgettable. Fun prom, homecoming, winter formal dance limousine, shuttle party bus transportation with professional and licensed chauffeurs. All ground corporate transportation options from luxury sedan airport transfers to 50 Passenger executive shuttle bus transportation in the greater Los Angeles area. I booked BestOCLimo.com for my wife’s birthday party this month and we had a great time! The group was 22 people on a party bus from Orange County to the Temecula Wine Country. Everything was on time, the bus was comfortable and everyone thought our driver was great! I definitely recommend this company! We had a wonderful experience with this company. On time, clean and all around great service. I shopped around and the price was reasonable but you can’t really put a price on getting to your destination safely! We rented a 20 passenger party bus around OC for five hours on a Saturday night. It was kind of a last minute decision from our group but Karl was super helpful and efficient getting us set up. He was always a phone call or text away. My friends and I had a great time! Highly recommend!